ue to the presence of a public well, there was a Roman villa not far from the south of the site of La Chavonnière. It was destroyed during the 4th century following a farmers’ revolt against Roman taxation, as evidenced by the discovery of the remains of ancient buildings, carried out in 1854 during a process of deforestation. This discovery led to excavations in 1855, which led in turn to the discovery of a skeleton along with a Roman coin (remnants of an antique belief of the obol’s payment to Charon, the ferryman?). Au moyen-âge, sur l’emplacement actuel était établie une exploitation agricole qui dépendait de la châtellenie de Véretz. Détruite pendant la guerre de Cent ans, elle fut reconstruite, le calme revenu. In the Middle Ages, on the present site there was a farm, part of the seigneury of Véretz. It was destroyed during the Hundred Years’ War and rebuilt once peace was restored. The construction of the mansion on the plateau which overlooks the Cher valley dates back the end of the 17th century, but a part of the outbuildings were built in the 15th century. This house was flanked on the south by a dovecote. In 1630, the place was known as Chavonnes. It is only in 1651 that it took the definitive name of Chavonnière. Toponymy, a fluctuating science, has put forward several hypotheses to explain the origin of « la Chavonnière ». Thus M. Marchadier sees the word Chavonnière as derived from the old French chaoinie or chavoignie, distorted forms of « Chaonie » which means « bois de grands chênes ». More recently, Mr Gendron offers two hypotheses: Chavonnière may have been related to chavon, an old word for “screech owl”, or with a man called Guillelmo Chavonneau, a known owner in Véretz during the 14th century. The matter is far from being settled. La Chavonnière was a “closerie” (vineyard) with a living house and was enclosed in a stone wall. 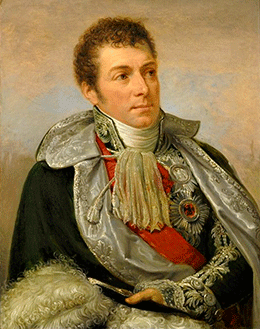 It is Augustin Isambert, town councillor of Véretz from 1815 to 1819, who sold La Chavonnière to Paul-Louis Courier for the price of 22,600 F. The former owner was his own father, a general shot under the Convention upon the intervention of Saint-Just. The entire property passed to his widow and then to his son, Augustin. aul-Louis settled in La Chavonnière with his wife on April 21st, 1818, the very day of the purchase, which had been fixed at 22,000 F, not-including interest. Herminie will keep a “livre de raison” (an account book for family chronicles), a usual document at that time, that she will call “book of La Chavonnière, our property.” The sale conditions were calamitous for the buyer, who committed himself to leaving one part of the building unoccupied for the seller for… ten years! The awful Manette, Augustin Isambert’s mistress, made Herminie’s life impossible. Courier was consequently forced to bar Isambert and his partner from accessing La Chavonnière. Hence, a lawsuit. In the verdict, delivered in February of 1820, Isambert was ordered to pay the legal fees and Courier was condemned to pay a smaller fine than the amicable compensation that he had proposed to his opponent before the registration of the complaint. 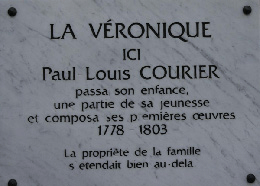 Paul-Louis Courier’s remains rest at La Chavonnière since April 11th, 1825, the day after his assassination in the forest. The “closerie” consisted of 30 acres of land, a quarter of which were planted with vines. The nearest property was the Roche-Morin’s castle – neglected after World War II – purchased in 1821 by the marquis de Siblas (a short-lived Mayor of Véretz at the beginning of the July Monarchy). The Couriers and the de Siblas maintained good relationships. Louis Frémont entered Courier’s service in 1819 as a gardener. Starting in 1824, he fulfilled the job of gamekeeper. Fond of the bottle and not very clever, he shot down his master, pressured by Symphorien Dubois. 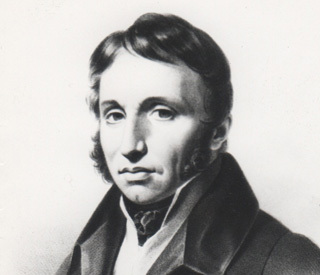 Paul-Etienne Courier was born at La Chavonnière on September 30th, 1820. The police carried out a search in it on July 20th, 1822, in the absence of its owner, to try to find copies of the Petition for villagers who had been prevented from dancing (Pétition pour des villageois que l'on empêche de danser). La Chavonnière was under permanent police surveillance; it is almost certain that an informer infiltrated its numerous employees. Pierre Dubois was hired at La Chavonnière as a ploughman and a carter the Midsummer Day of 1823. Courier dismissed him on July 18th, 1824. He paid his wages plus a compensation for the loss of the job. Pierre had gotten his brother Symphorien employed at La Chavonnière in February of 1824. After the master’s death, Symphorien was commissioned by Herminie to run the farm. He was not yet 32 years old when he died on August 18th, 1827, as a result of congestion. Louis-Esther Courier was born at La Chavonnière on October 20th, 1824. Starting in January of 1825, Mrs Courier left La Chavonnière with Paul-Etienne for Paris. She came back only ten days after her husband’s assassination. 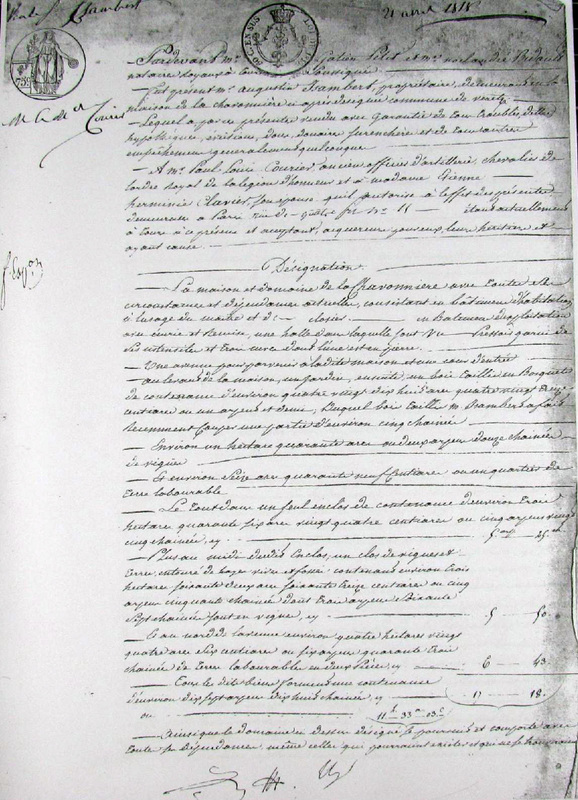 sambert resumed ownership of La Chavonnière on July 23rd, 1827 for the amount of 26,000 F because only the interests had been paid by Courier when he was alive. He did not however move back into the house but donated it to his daughter on the occasion of her marriage in 1839. Much later after the death of the Courier family, the pigeon house located south of La Chavonnière was torn down. For what reason? Impossible to say. Maybe it was the work of Isambert’s descendants, or perhaps that of one of the new owners. Only one thing is certain: besides the outbuildings constructed south of La Chavonnière and visibly anachronistic in comparison to La Chavonnière’s architecture, it has kept its character, if not its configuration since Courier’s time. Unlike today, the main entrance was directly south. In 1872, Philippe Habert-Avenet bought La Chavonnière. His son Eugène inherited it at the end of the century. In the lifetime of the latter, the 3rd Saturday in April of 1912, a visitor’s book was opened at La Chavonnière. This book has the signature of numerous visitors from all countries, admirers of the lampoonist; among them Robert Gaschet, the first of Courier’s biographers, and Anatole France. On Sunday September 8th, 1818, a committee organized an event at La Chavonnière. A commemorative plate was mounted and Anatole France delivered a speech. On November 23rd, 1955, on Mr André Rivière’s initiative and with the full agreement of Mrs Blanche Habert, a tribute to Courier was paid at Véretz (specifically at La Chavonnière). The place was open to visitors until 1988, date of the death of Blanche Habert who accurately remembered the visits of Mr France when she was a little girl. One can still see the crack in the chimney’s fireback caused by Fremont’s gun shot on the evening of the assassination. After the death of Mrs Habert’s children in 1989, La Chavonnière was not occupied. Squatted in several times, it was the victim of a disaster the night of New Year’s Eve 2004 -2005: the outbuildings of the 15th century were devastated by a fire for unspecified reasons, though it was indisputably not a matter of chance. Purchased and restored since this sad event, it is again a dwelling place for a Touraine family and thus it is saved from any risk of disappearance. L. Marchadier, Paul-Louis Courier, its estate of La Chavonnière, his private life…, Imprimerie tourangelle, 1925. René Caisso, la Chavonnière and Paul-Louis Courier, cahier PLC, november 1973. Stéphane Gendron, Names of place in Véretz, Tours 2007.